When I first started this blog I was training for a half marathon. Even now it seems like that was a bigger stretch of accomplishment than doing a 3 day 172 mile ride. Then again, even as I write that down, that 172 seems like an awful lot. Kind of daunting, really. But I will say that the half marathon training was definitely more demanding. Right now the temptation is to compare the two. Is running better or is riding better? Yes. There are similarities and huge differences. But in the end, both are a part of who I am. For me, running started out as my way of getting to school more quickly. Or more it was a matter of being able to leave a bit later. I discovered back then I could run at a good pace for about a block, then I’d be toast. So I’d run a block, walk a block. Soon it was run two, walk one. Then I could do a mile, even several miles, and could hold about a 6 minute pace. I really should have picked cross country as my sport (how did I ever pick tennis? It was just one year, and my only year of anything on an organized high school sports level, but it was a flop). And the thing is, I enjoyed it. But then I got my bike. Okay, the true story is I wrecked my car and didn’t have the money to buy a replacement but I could get a nice bike. And while I enjoyed running, I LOVED riding. I could relate more to the character from Breaking Away though I never got interested in pretending I was Italian. I’d ride to see friends out of town. I could do long rides as if it was going across the street. I think I’m sadder about getting away from riding than I was about getting away from running. And then, there was a poster, for the Bike Ride Across Nebraska. It was either the first or second year. I don’t remember what the conflict was, I know I couldn’t go. But oh man I wanted to. Ever since then, that’s been a bucket list kind of thing for me. As I started to take my life back, it was getting back on the bike that got me to the point where I could then run. I started taking my bike to work. Okay, I’d take public transportation (but you can take your bike on the light rail here) and ride my bike the last mile. Then I started getting off a stop earlier to ride in. Then 2 stops, and soon I was riding 17 miles to work. And that got me to running again. And I enjoyed running. Or maybe I enjoyed that I could do it again. I felt good that it didn’t take the kind of toll on me I was afraid it would. Well, okay, my back was giving me fits, and I’ve got arthritis now in one ankle though I think it’s more related to an injury from high school than the running). Running the half marathon was an awesome feeling. But you know, a half marathon was never a bucket list thing. A bike tour… yeah, that’s still there. A couple of years ago I saw they were starting Pedal the Plains. It was a good next step. It’s also in a part of the state I love (who ever thought one could love eastern Colorado? More on that another time maybe). At that time my focus was on running, but it was definitely on my radar. Okay, that happened to my wife, not me, but that’s awesome enough I had to find a way to get it into my blog. 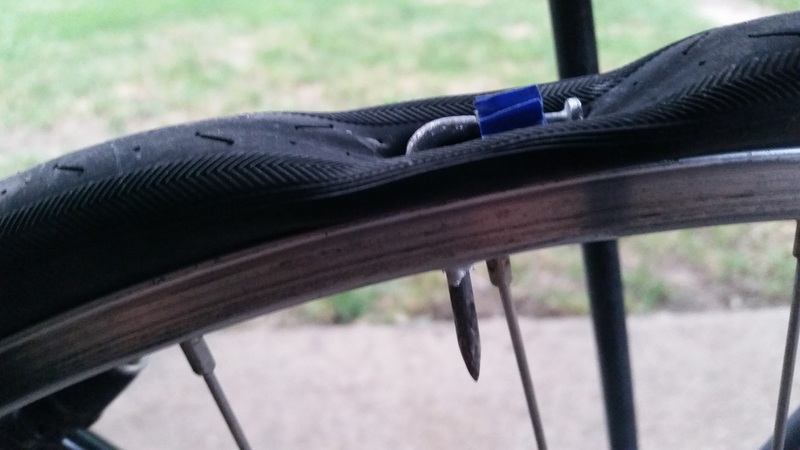 Now I have to admit, I’d much rather have that happen to my bike than to my foot, right? But here’s the thing. There’s still a joy to jumping on the bike. I find myself wanting to get on the bike just to ride it. Not to train, not to work towards being able to go further, but just to get on and enjoy. I find myself more intrigued to do a 6 hour bike ride through countryside than a 3 hour run. In the end, maybe that’s what the difference has been that has had me more focused on the bike. Running has been about weight loss and about training. When I’d go to run, it was always part of preparing myself to run a race. It was training. It was something I needed to do. Right now when I ride, even though I say I’m training for Pedal the Plains, it doesn’t feel like training. I’m just enjoying the ride.